Our service, High Yield Landlord, recently reached 300 members and became the #1 ranked real estate service on Seeking Alpha. To thank you for your continued support, we are giving away our exclusive Portfolio Tracker to all new members.All we are asking you in favor is to take a 2-week free trial to our service to come see what we are about. If you like our approach, we invite you to stay and invest with us. If not, you are free to leave at no-cost and continue to use the Portfolio Tracker free of charge. If you are ready to expand your real estate investments in 2019, take action now and and decide within your 2-week free trial whether this service is something for you or not. You have everything to gain and nothing to lose. Below we present our new tool. I hope you enjoy it! We are pleased to announce the launch of a new exclusive tool that will help HYL members track their investments with greater ease in one single place in a simple format. 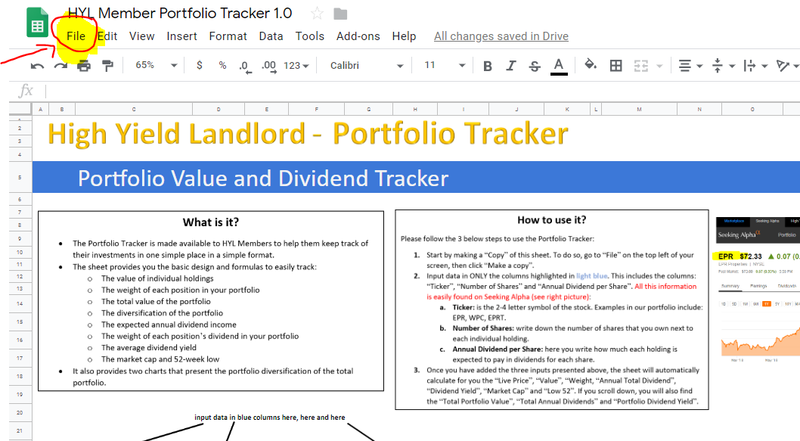 This tool is a Portfolio Tracker that is made available to all HYL members for free as part of their subscription. 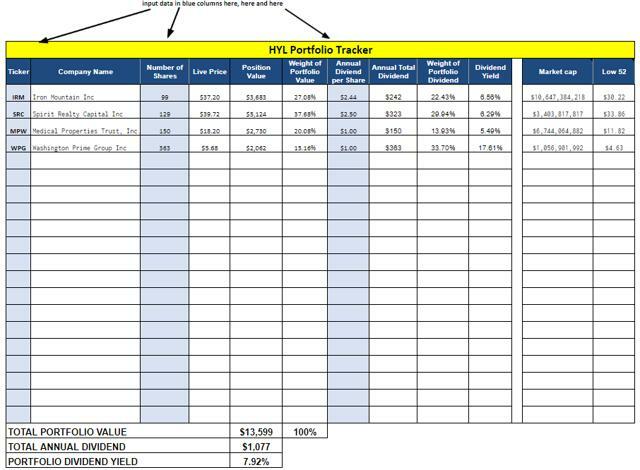 What is the HYL Portfolio Tracker? 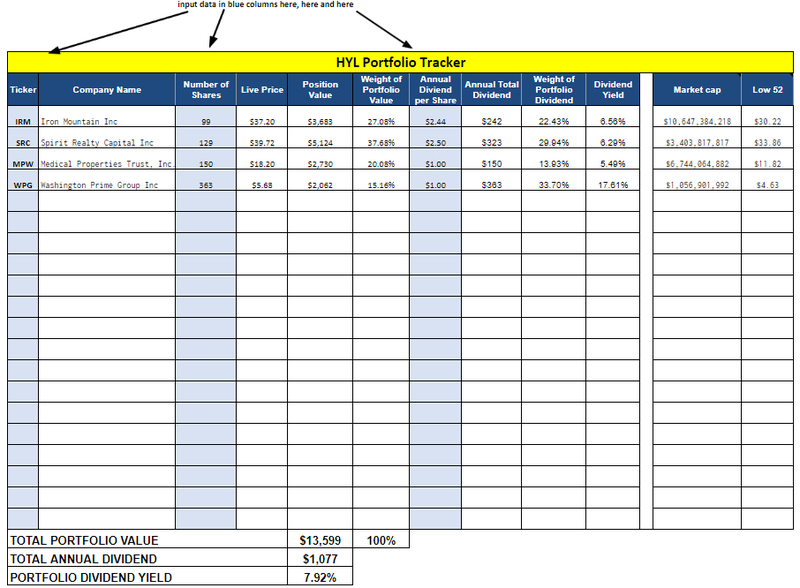 How to Use the HYL Portfolio Tracker? 1- Start by making a “Copy” of this sheet. To do so, go to “File” on the top left of your screen, then click “Make a copy”. Ticker: is the 2-4 letter symbol of the stock. Examples in our portfolio include: EPR, WPC, EPRT. Number of Shares: write down the number of shares that you own next to each individual holding. Annual Dividend per Share: here you write down how much each holding is expected to pay in dividends per year for the full year. (if you are having difficulties to find this information, we provide additional explanations below). 3- Once you have added the three inputs presented above, the sheet will automatically calculate for you the “Live Price”, “Value”, “Weight, “Annual Total Dividend”, “Dividend Yield”, “Market Cap” and “Low 52”. If you scroll down, you will also find the “Total Portfolio Value”, “Total Annual Dividends” and “Portfolio Dividend Yield”. You can check out all our 52 reviews to see that these are not exceptions. To read our reviews, please click here. It is increasingly difficult to find bargains after the latest run-up in share prices. Therefore, we are particularly excited to announce that we have identified a new opportunity with +30% upside and valuable diversification benefits to our Portfolio. 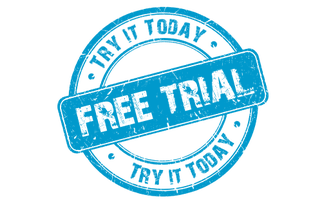 It is a “Blue-Chip” company with a lower risk profile. We are finalizing our due diligence and expect to publish a BUY Alert later this week. As always, members of "High Yield Landlord" get an exclusive look at all our highest conviction investments. We are currently sharing the full list of our REIT investments with "High Yield Landlord" members along with a report entitled "Our Favorite Picks for 2019". We invite you to join us today for a 2-week free trial to have a closer look at our investment strategy, portfolio holdings and tracker. 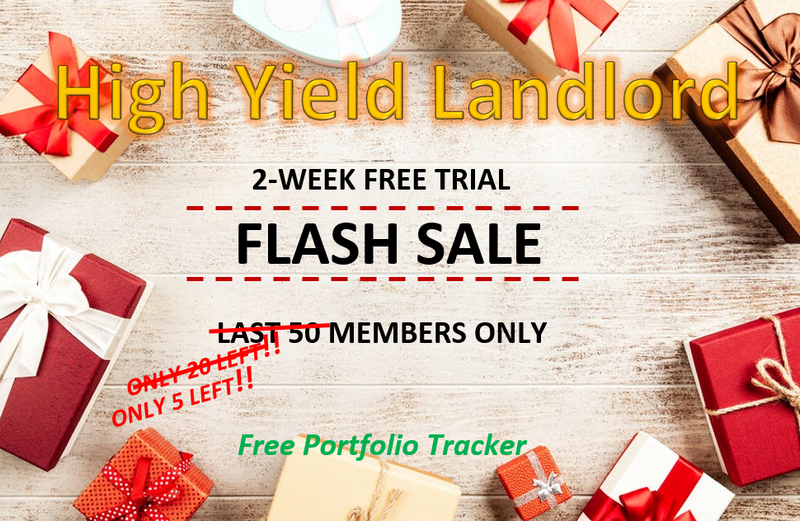 If you’re looking for a better way to invest in real estate and other dividend-paying stocks, I believe you will find High Yield Landlord to be just that. 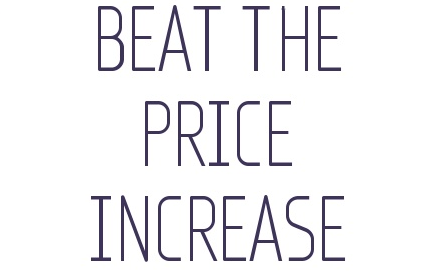 Our prices will increase soon but all members who sign up now are grandfathered for life at today's discounted membership rate. If you are looking to expand your real estate investments in 2019, take action now and lock in the current rate while you still can! Disclosure: I am/we are long ALL STOCKS IN CORE PORTFOLIO AT HIGH YIELD LANDLORD.